As you know, I’m a HUGE fan of making my own beauty products. I share several on my Home Tips Page. Well, today, I want to share 5 DIY Beauty Recipes You Can Make Yourself using items you may already have around your home! These 5 DIY beauty products are simple to make, and I love adding them to my favorite Grove Collaborative glass spray bottle. You can learn more about it at the end of this post! Facial Toner – Combine 1/2 cup raw, unfiltered apple cider with 1/2 cup water (you can add essential oils or brewed herbal tea too!) and gently spray onto your skin. Insect Repellent Spray – Mix 1 1/2 cups of witch hazel, 2 tbs olive oil, 100 drops of essential oils like lemon, cedarwood, lavender or rosemary recommended). Shake well and apply. Hair Detangler Spray – Bring 2 cups of water to a simmer and mix with 1/2 cup of creme conditioner. Pour in spray bottle and apply to ends of hair. You can rinse it out or leave it in as a leave in conditioner. Skin Moisturizer – In a spray bottle, mix 1 1/2 cup of warm water, 2 tbsp liquid coconut oil and 10 drops of lavender essential oils. Spritz on face and neck before bed. Items will separate, so shake well before each use. 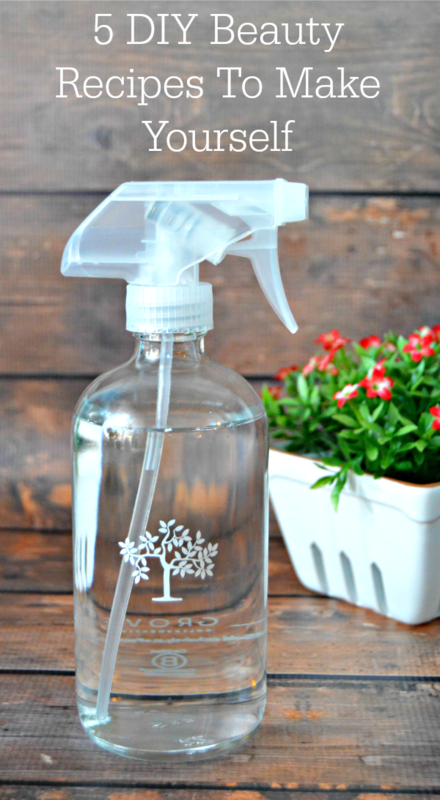 Deoderant Spray – Fill your spray bottle with 1 cup of witch hazel. Add 20 drops each of Frankincense, Lavender and Lemon essential oils. Spray under arms and in any area that you feel may need a little deodorizing boost! My favorite is the Insect Repellent Spray for sure because I really do not like the chemical smell and greasy feel that most store bought bug sprays have. I love that these items can be made pretty inexpensively with household items and that they don’t contain tons of ingredients that I can’t even pronounce! 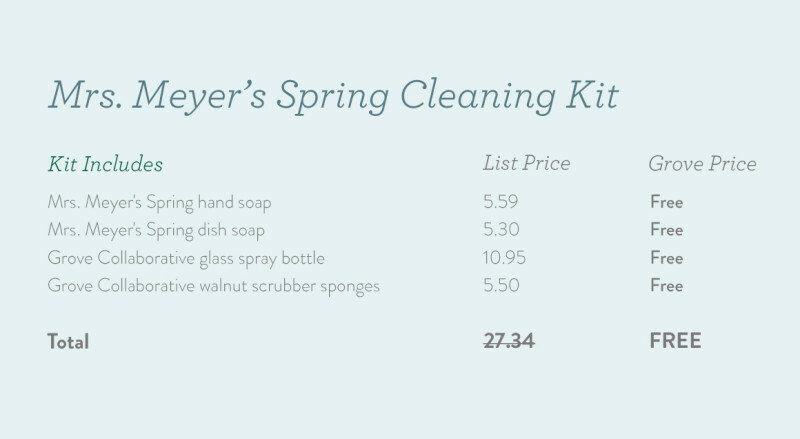 So…I wanted to share Grove Collaborative’s Mrs. Meyer’s Spring Cleaning Kit offer with you because it is only available until 9pm EST today, Tuesday, March 22! You can read all about it HERE if you are looking for more information. THE BEST PART OF THIS OFFER? WHETHER YOU’RE NEW TO GROVE OR AN EXISTING CUSTOMER, YOU CAN TAKE ADVANTAGE. Sign up for Grove Collaborative HERE . 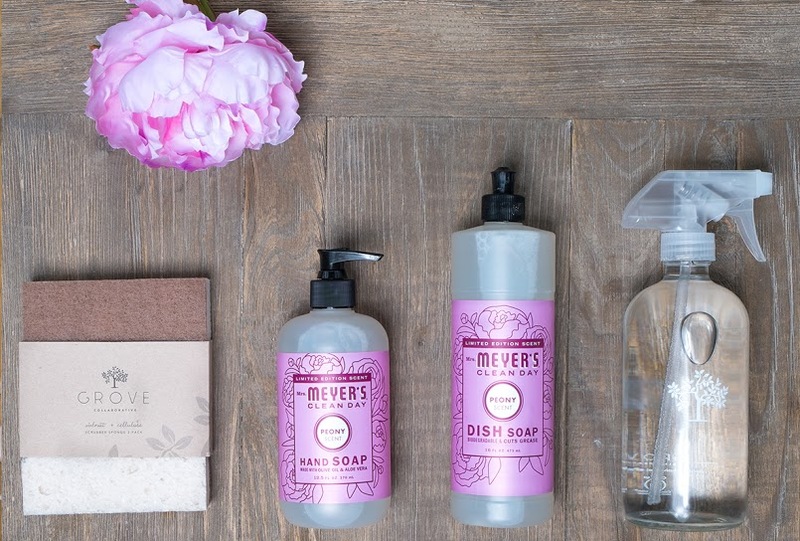 You will receive the Mrs. Meyer’s spring seasonal offer for free when you sign up! BONUS!!! Selected readers will win a bouquet of spring flowers delivered to your door! 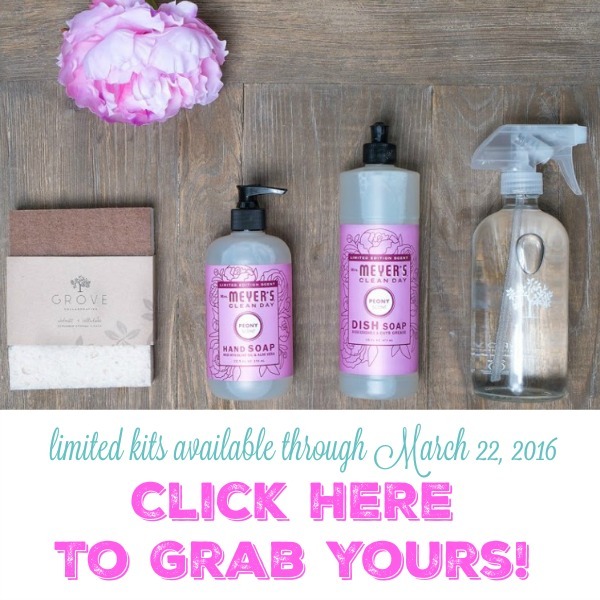 1 in 50 readers will receive a gorgeous spring bouquet from Farmgirl, The Bouqs andBloomThat! They will even be personalizing each bunch and delivering same day where possible. Good luck!! I’m interested in the insect repellent. My question is, do you add water to this mixture? The recipe does not seem like it makes enough. Is there a reason for the glass container vs plastic? Hi, Duane! Some essential oils break down the plastic bottles and sort of melt them. They work much better in glass bottles. Hope this helps! Where is the cheapest place to get essential oils? Opaque Nalgene bottles don’t break down the way the regular spray bottles do, and are UV safe – they are also polypropelene and BPA free. Nalgene is the plastic used for pill and sometimes ink bottles. I use the Brown ones for my DIYs, but you can buy the 500ml and larger in white as well. I’ve been using them for about 10 years and never had a problem with Essential Oils beaking them down yet. in the insect repellent spray is 100 drops of essentials oils a type error instead of 10 drops.